Uniforms throughout the years, from L to R: Senior Constable Tanya Dooley in pre-1960s uniform, Sergeant Brenda Orr in 1970s mess dress, Constable Jessica Callahan in 1980s uniform, Constable Ysanne Harper in 1990s uniform, Senior Constable Jillinda Mollon in 2000s uniform and Constable Rosie Helm in 2017 uniform. Initially Policewomen were provided an allowance to buy a plain black skirt and black jacket over a simple white shirt. They would team this with a black or white beret or hat, with white gloves and a black leather handbag. Women were allowed to wear an adapted Inspector’s cap badge on their hat and jacket. Over time, handbag contents included a baton, handcuffs, notebook, torch, white gloves and sometimes a firearm. Policewomen were forbidden from removing their jackets in public, whereas men could wear shirt sleeves. Policewomen who did so were punished by having to stay back and type reports. Tunics changed from black to blue and matched men’s. Standardised police hats were worn, and numbered badges were worn on the chest. Trousers were allowed to be worn on night shift. Long overcoats provided warmth and later reduced to waist-length to allow access to accoutrements. Court shoes were to be worn – even on night shift foot patrol. This was a time of change, with the introduction and discontinuation of assorted uniform items, such as leather jackets. Combat boots were introduced. Ties were standardised with men. Specialist and secondary uniforms were adapted for use. Introduction of the Multi-Use Integrated Protection Vest. Associated undershirts replaced blue cotton shirt and metal badge. Accoutrements moved from belt to vest (excluding firearms). A baseball cap replaced a formal hat. 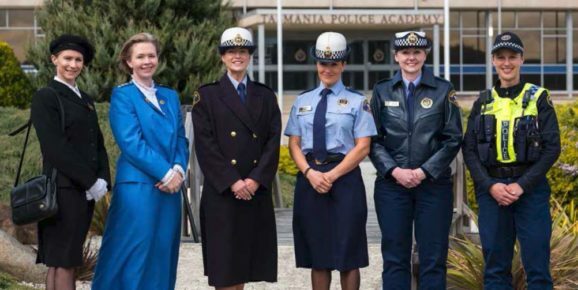 This page -- https://www.police.tas.gov.au/about-us/100-years-women-policing-tasmania-police/fashion-on-the-frontline/ -- was last published on January 17, 2018 by the Department of Police, Fire and Emergency Management.